Montaione is a lovely medieval village, located between Pisa and Florence. 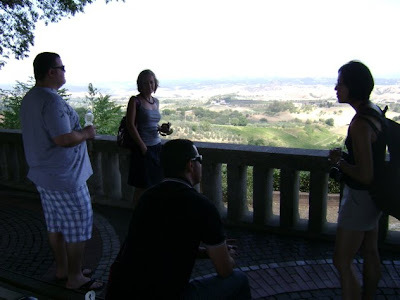 We visit Montaione in our way to San Gimignano, a very popular tourist destination, just to show our guests a typical Tuscan village where traffic, buses and souvenir shops are truly unknown. Here, we always have a picnic lunch, enjoying it on a bench under trees with a mind boggling view of the Tuscan countryside. Early in the morning, I make sure to get sandwiches, beers and soft drinks at an amazing bakery called “Il Gastronomo”, located in the small village of Capanne, near Pisa (where my mom and dad live). Sandwiches are simply fresh oven baked Schiacciata bread and Mortadella. This is for me one of the best sandwich I have ever had in my entire life, and the funny thing is, that it is just bread and deli meat. No cheese, no condiments, no produce…schiacciata e mortadella with one the most spectacular view is something that can not be describe by words or pictures, but you have to live it and experience it with all of us!